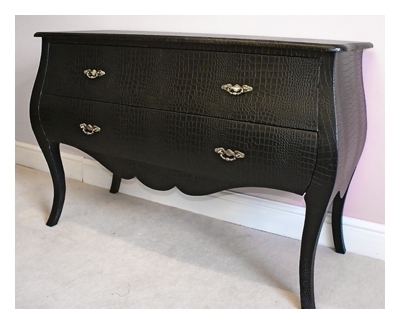 Moc Croc Black Shabby Chic Bombe Chest This lovely, extra large and very glamorous two drawer chest of drawers makes a real style statement! Beautifully finished in a really authentic, semi matt Back faux leather moc croc, over solid wood, with stunning antiqued handles. This style of furniture is hot news, and bang on trend in the interior design market. The sheer size of this gorgeous piece of furniture is magnificent! Looks fabulous in a lounge or dining room, with a large lamp on, or as bedside chests if you are lucky enough to have the room! The two large and roomy drawers are lined in dark brown fabric. Due to the nature of hand finished furniture small imperfections may occur are intentional, and add to the charm.